During my discount graphic novel shopping last week, I found some deals! As you know, many of the books that I reviewed last week, came from my Memorial Day shop-a-thon. I was lucky enough to find this one in my digging for deals as well. 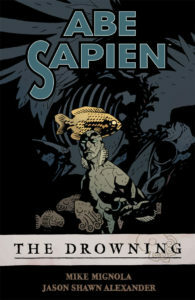 I didn’t know that BPRD agent Abe Sapien had his own book, and this accounts his first solo adventure. 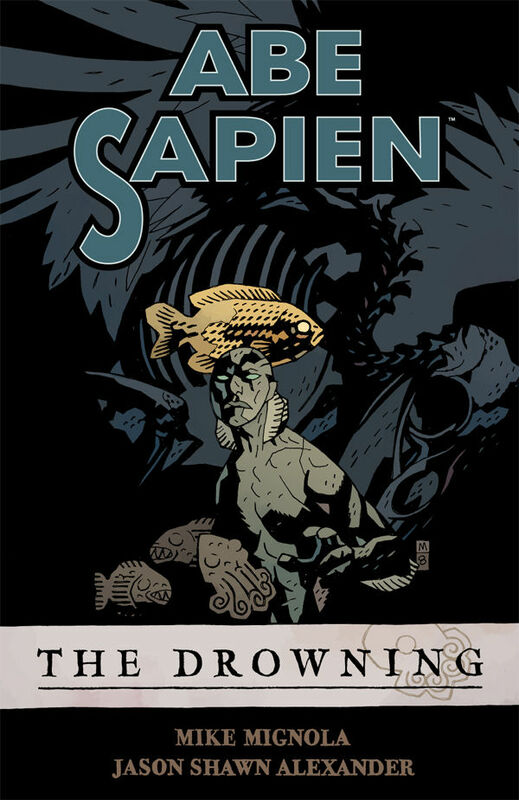 Fans of Hellboy will be pleased to know that there is an Abe Sapien book out there penned by Mike Mignola and drawn by the talented Jason Shawn Alexander. This book feels like a Hellboy book. The art, the dialogue, the abstract occult images paired with muted colors and heavy shading…it has it all. The story is good, taking five issues and combinging them into Abe Sapien’s first solo adventure, we discover an interesting backstroy, a solid plot, and we get to experience Abe’s hesitation, fear, and uncertainty first hand as he travels into a strange adventure without the help of Hellboy at his side. I think I was most fascinated by the back story that ultimately sets the adventure for the BPRD into motion: imaginative and well-created paced for this particular story. A solid PG-13 title, this book will find itself on the “Horror” shelf in my classroom. My students are always asking for more horror, so it’s been great this past year to find some great new classroom-appropriate horror books. Dark Horse has been instrumental with the Hellboy family.